A site deep in the forest outside Warsaw, Poland, where the Nazis, during Germany's occupation of Poland in WWII, executed some 2000 Poles, mostly intelligentsia and politicians but also Jews. It's now a National Memorial site and has recently been updated with the addition of a small but state-of-art museum. More background info: You quite often encounter parts of forests in Poland and the former USSR that harbour dark historical secrets. This one, the forest of Kampinos just west of the little village of Palmiry, just outside Warsaw, has in fact two. On the one hand it served as a refuge for Polish resistance fighters fleeing from Warsaw when it was subjected to German occupation, and eventually almost total destruction. Some of the Polish AK (cf. 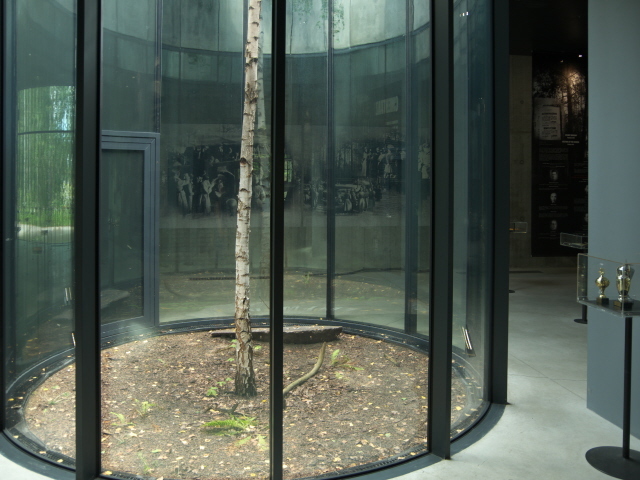 Warsaw Uprising Museum) used these forests to regroup, train and hide weapons. Ironically, though, the same forests were also used by the Nazis for 21 secret mass executions and burials of Poles, most of whom had previously been incarcerated in the infamous Pawiak prison in Warsaw. Many of the victims were Jews but also (often at the same time) industrialists, politicians, artists and activists or other members of the intelligentsia and even famous sportsmen, who the Nazis for one reason or another regarded “enemies” or simply undesirables they wanted to get rid of. The executions took place between 1939 and 1943, mostly in the early phase of the occupation. Most, if not all, of the names of these victims will not be familiar to non-Polish outsiders, but here are a few examples: Henryk Brun (manufacturer/merchant and one-time member of the Polish parliament), Witold Hulewicz (poet, translator and activist of the Polish Writers Association), Janusz Kusocinski (Olympic sportsman), Helena Jaroszewicz (political/social activist and member of parliament and senate) or Jan Pohoski (vice-mayor of Warsaw). The total number of victims given varies a bit. At the site itself the precise number of 2115 is given, while other sources (including in the new museum exhibition) say ca. 1700. Nevertheless, every individual victim of these atrocities is one too many. Most victims were killed by a single gunshot, larger executions took the form of lining them up blindfolded at the edge of a previously dug pit and mowing them down with machine guns. The pits were then covered up with moss, twigs and young trees and the perpetrators hoped that their deeds would never to be discovered (cf. also the death camps of Treblinka, Sobibor and Belzec). However, locals knew about the killings and passed the knowledge on to the underground organizations. One of the worst of the mass executions was also photographed by some of the Germans present (despite orders to the contrary) and some of these pictures were intercepted by the Polish intelligence service and sent to London. And so the search for the mass graves and an investigation into the atrocities began immediately after the war. Once discovered, exhumations began and about half of the victims could be identified. The others, however, remain nameless to this day. The site was declared a National Memorial as early as 1948. The dead were reburied in a large cemetery of both marked and unmarked graves. Most are from this specific site, but others from associated other mass killing and burial sites were also reinterred here. Much more recently, with the help of European Regional Fund subsidies, a brand-new museum was set up in place of an insufficient predecessor between 2009 and 2013. What there is to see: The main memorial part consists of the large military-style cemetery. It's basically a sea of little stone crosses, some with names on, others nameless. At the far end stands a trio of tall crosses. A bit to the north-western end of the cemetery there a few more concrete crosses in the forest commemorating the place where the executions actually took place. (Yet more crosses can be found two thirds of as mile (1 km) away en route to the village of Palmiry – though I did not see those myself). At the southern end of the cemetery there's a stone monument that, in four languages (Polish, Hebrew, German and Russian), dedicates the place to the 2115 Polish citizens buried here who were murdered by the German occupiers (my own, abridged, translation). The new museum is just south of the memorial complex/cemetery. It is housed in a striking modern edifice clad in rusty metal. Once inside it's hard not to be impressed with the modernity of the whole design. It may be a comparatively small museum, but it feels airy and spacious and very contemporary. And the quality of the presentation is excellent too, including the explanatory texts, all of which are bilingual in Polish and English – and of mostly a high level of translation quality (which by no means goes without saying in Poland – so extra praise is due for this). 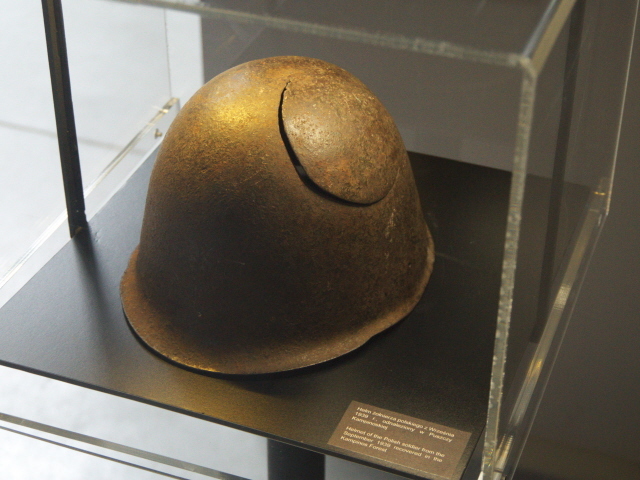 The exhibition covers the prehistory of the site to some degree and then quickly moves on to its main topic, the role the place served during WWII, both for the partisans/underground fighters and for the Nazis as the site of those mass executions. The names and roles of quite a few prominent victims (by the Polish standards – none of the names had been familiar to me before) are listed in some detail, and there are lists of all victims, and of the individual 21 executions. The nature of the executions is explained as well as the whole background of the occupation. Another section is devoted to the Warsaw Uprising, when the forest of Palmiry again played a role. There are plenty of photographs and documents for further illustration. There are also original artefacts on display, including items found during the exhumation of the victims. This includes some touching artefacts such as the wedding ring of one of the female victims (by means of which she could be identified), or the package of items and documents found during the exhumations and handed over to the relatives of the victim associated with these … yet these relatives decided never to open it, and so it is now displayed still wrapped up. Also on display is a rusty German-made machine gun unearthed in the area – though it is unclear whether it was used in the mass executions or not, as the same type was also used by the Polish partisans. In addition to static displays there are also some video/projection elements to give the exhibition a modern, multimedia-mix character. This includes a film sequence of a re-enactment of one of the mass executions, which is pretty hard to watch. All in all, this is a pretty remarkable little museum, well-laid-out and engaging, even if its topic is probably a little “exotic” and limited from a foreign visitor's perspective. Nevertheless (or rather: all the more so) it is a good chance to educate yourself a bit more about parts of Poland's dark history that you may not even have heard about before. Worth the (complicated) detour. Location: right in the middle of a large forest some 13 miles (20 km) north-west of the centre of Poland's capital city Warsaw (as the crow flies), and some 3 miles (5 km) south of the village of Palmiry. Access and costs: not so easy to get to, but free. This narrow road leads deep into the forest. Do keep going even though signage stops. It's a good three miles (5 km) through the forest until the memorial site/cemetery suddenly appears on your right. Keep going a bit further and an unpaved driveway takes you to the car park behind the museum. It is in theory also possible to make it here by public transport, but it's a bit tricky. For instance you could get a train or bus to Zajezdnia Żoliborz or the Metro line M1 to the terminus at Mlociny and from there take bus line 800 which actually goes to the memorial. But this will take well over an hour. Better plan well ahead (and be sure about connections for the return journey). The museum's opening times are: Tuesday to Friday 10 a.m. to 6 p.m., Saturdays and Sundays only to 4 p.m., closed Mondays. Last admission half an hour before closing. Time required: between half an hour and an hour and a half for the museum, depending on how much you want to read/watch/listen to. Plus some time for the memorial/cemetery. Combinations with other dark destinations: in general see under Warsaw. It is possible to slot a visit to Palmiry in either when approaching or leaving Warsaw – as I did when I came from Lodz. If you come from the north-west (e.g. Gdansk) along the main No. 7 road it's easiest. Otherwise you'll first have to go through central Warsaw and get the No. 7 road from Most Gdanski. A GPS will most certainly help. Note that an approach from the south to the memorial appears to be possible by looking at maps, but neither Sat Navs (GPS) nor online route planners seem to ever suggest this. So I reckon it's a bad road or not a real connection at all. So better go via Palmiry village to make sure you get there. Combinations with non-dark destinations: see under Warsaw and Poland in general.